"I had lost all hope in the education system for Josh, until he came to you and in the short time he has been with you guys he has become my little boy again. I absolutely love that Josh comes home and talks about his day and all of you at The Roaches. He smiles again and people now like to be around him. I honestly can't thank you enough for this, you have changed our lives back around. Josh now has a bright future to look forward to which has only become possible by attending The Roaches and being taught by handful of people who truly care about his education and who have made him feel loved and most importantly wanted. Thank you so much again for all you do for my family." "My son has been attending the Roaches School for four years. During this time he has been in full time education where previously he had been excluded from two mainstream placements. His self esteem and confidence were very low prior to attending the Roaches. He had attempted suicide at 7 years old and often stated he wished he was dead. Since attending the Roaches his confidence has excelled, his behaviour has improved dramatically and he is much happier within himself - he likes himself. This wouldn't have happened without the support from all the staff at the Roaches who I have regular contact with, and offer support not only to my son but to us as a family. I feel that if my son had remained in mainstream school he would not have received a fulltime education or the support required for his condition. I would recommend the Roaches School to any family who have a child who requires a lot of extra support with not only their education but also their social and emotional needs and general wellbeing." A huge thank you to our wonderful children, parents and staff team in achieving an outstanding Ofsted rating once again. "The school provides an exceptionally high standard of education to pupils who previously have had a very varied experience of schools"
"Safeguarding is of the highest standard. It is central to everything the school does." Following a fantastic Ofsted outcome in November 2010, we've done it again! We're outstanding! We were recently inspected in October 2013 and the visiting inspector said "the quality of the teaching is outstanding and pupils overwhelmingly agree". This is a reflection of the dedication of the team at The Roaches and the commitment of our children to self improvement. Moreover, this is a significant achievement for the school because the demands for an outstanding award are so great under the new inspection framework. This was a team result; a joint venture by the pupils and staff team and the culmination of years of refinement and hardwork. The Roaches School is a therapeutic centre for children from the age of seven up to sixteen with social, emotional and mental health difficulties. The needs of our children are extremely important as they are our future generation but for children who have social difficulties, placing them in the correct environment is paramount. This is where the Roaches excels. Based on two sites, Lower School (Lower Roach End Farm) nestling among heather-clad moorland and high rocky outcrops in the Peak District and Upper School (Satis House, St. John's Annexe and CatSkill) in the nearby green and leafy town of Biddulph, it is well positioned to help boys and girls with complex social difficulties to flourish. In 2010 the school was awarded "Outstanding" by Ofsted and achieved "Healthy Schools" status. We are once again outstanding in 2013/2014. Have you heard that we now offer Alternative Therapy? Both types of therapy help to promote sleep, rest, relaxation, feelings of calm and are proved to facilitate emotional stress and anxiety. Pupils at Upper School took part in a minutes silence to remember those who lost their lives in the London terror attack. Upper School Raised £107 for Dougie Mac.....Well Done! The Roaches School has achieved Healthy School status......A big well done to Amanda, Liz, Emily, Sanitta and the rest of the team. Details of the report can be found in Downloads. Pete, Arnie and Sam get in touch with their feminine side and dress up as women to show their support for Breast Cancer. 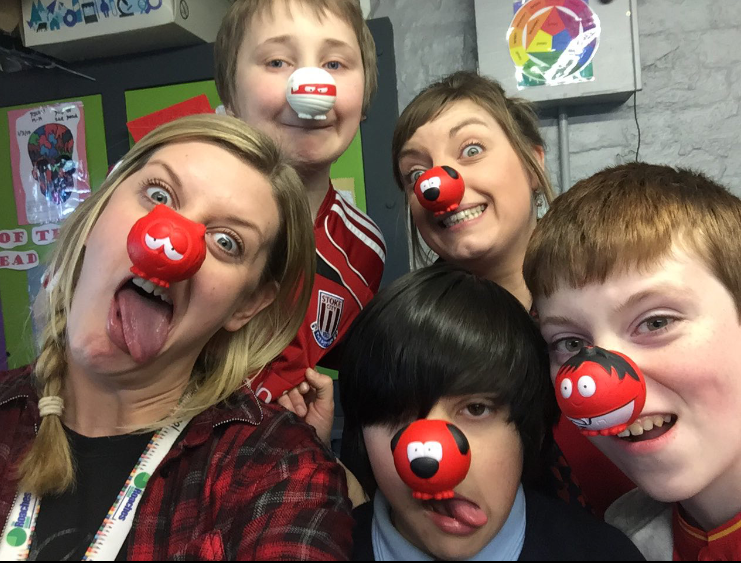 Alex raises £103 for Red Nose Day! Star fund raiser Alex Lomas has raised an astonishing amount for Red Nose Day. Our hero Alex dressed up in a garish red theme for the day in honour of those less fortunate. Alex is very driven to raise money and help others, and is regularly devising new ways to support charity. Here is Alex pictured with brummy Becky who insisted on being included in the photo. Matthew Ellis, Staffordshire Police Commissioner visits The Roaches School! The Roaches School were honoured to welcome Matthew Ellis who was interested in discovering the impact of the police cadet scheme on our young people. Nathanial, Kyle, Josh, Chey and Keiran represented the scheme and talked about Chey's involvement in Biddulph's Youth Advisor Council and the Roaches Lower lads' recent recruitment to the Police Cadet scheme. 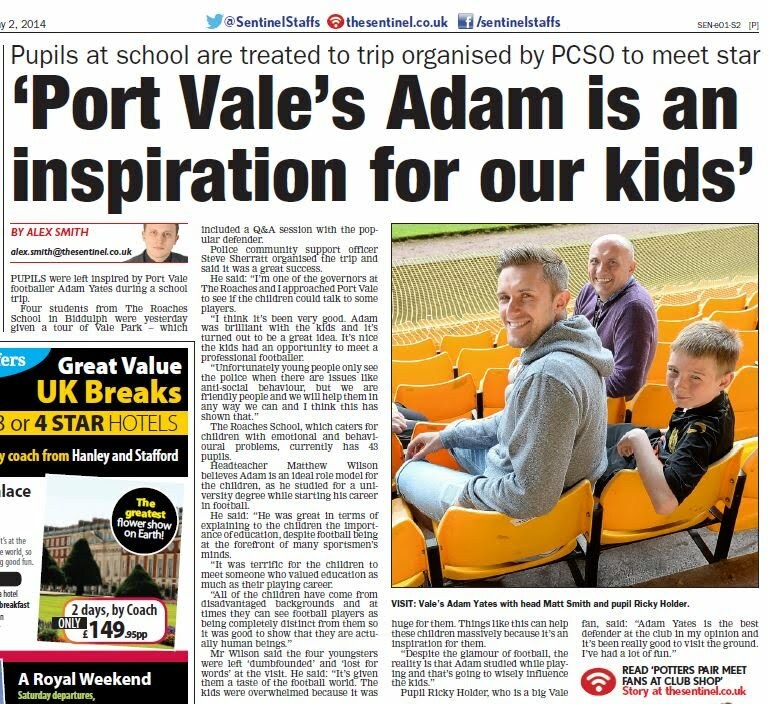 The Roaches School wishes to extend our thanks to Matthew and to PCSO Sir Steve Sherratt of The Vale who organised the event. Well done to our amazing female staff team for raising nearly £600 for Cancer Research. An incredible effort ladies. Everyone is so amazed by your wonderful achievement every year but this one was obviously special! Please follow our news link to see pictures from our recent Bateman Performance to older people from Biddulph Community. Roaches Old Boy Entertains Lower School! Jason Daiken is a former pupil of the Roaches School and now manages a pub in Buxton. excellent service at the Old Club House, Buxton. with, without which I don't believe I would have accomplished any of my personal goals. great start living in my natural family environment."